Vailima is the name of a village about four kilometres south of Apia, the capital of Samoa. The population is 1,462 (2006 census). Vailima is part of the electoral political district Tuamasaga. The village is most known as the location of the last residence of Robert Louis Stevenson, named "Villa Vailima". 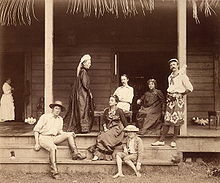 Vailima Letters: Being Correspondence addressed by Robert Louis Stevenson to Sidney Colvin were first published by Methuen, London, 1895. 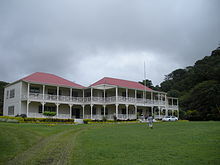 The estate has had a varied past with it functioning further as the residence for the governor of German Samoa, the administrator of the New Zealand mandatory authority and the Samoan head of state. It is now a museum in honour of Stevenson and has been substantially restored. The name Vailima means "water in the hand", according to an old Samoan tale. A woman gave some water (vai) in her hand (lima) to help her thirsty companion. A widely quoted misinterpretation states that the name means "five waters", as the word "lima" means both "hand" and "five" in Samoan. Stevenson is buried in a tomb on Mount Vaea overlooking Vailima. He had two wishes for his burial, to be buried on the top of Mount Vaea and to be buried with his boots on as he used those boots to walk on the Samoan lands. ^ "Population and Housing Census Report 2006" (PDF). Samoa Bureau of Statistics. July 2008. Archived from the original (PDF) on 21 July 2011. Retrieved 19 December 2009. This article about a geographical location in Samoa is a stub. You can help Wikipedia by expanding it.